Thanks to the variety of colors and textures, sizes and shapes that driftwood can be found in, they can add character and life to any aquarium. Driftwood can provide unique aesthetics and inspirations for decorating your aquarium. Some driftwood can affect the water quality as they leak out tannis and discolor the water. This means that not all wood can be used in your aquarium and those that can be, may need you to change your water treatment methods to offset this. In this article we will be going over some of the most common and readily available aquarium driftwood, and how to utilize them. Before we begin, one of the first things that you need to consider when trying to decide on the type of aquarium driftwood to use is the style of aesthetics that you are looking to achieve. By knowing this ahead of time you will be able to source not only the appropriate piece(s) of driftwood but you will also be able to find the compatible fish species. Along with the additional materials that would be required to complete your decorations. For those who are interested in having trees or moss covered logs as part of their layout. It would be wise to firstly find driftwood that can act as the body of this design. Branch like structures can help to provide the silhouette of a tree. A cylinder shaped piece of wood could serve as a classic log, or a piece of driftwood that is jagged at one end could be made to look like an uprooted tree that has fallen over. While hardscape is a term that is used for hard natural materials such as rocks and driftwood. Hardscaping in itself, is a style of layout that specializes in creating rugged, rough looking terrain. This sort of layout tends to be void of plant life. The barren look can often have a stark and often surreal appearance. If you are looking to use a minimal amount of plant life. You could consider a wind swept desert theme. An eerie Gothic layout that uses driftwood with bony like roots and branches. Or a rugged mountain ridge with a twisted piece of driftwood. If you seek to have a lush green aquarium, full of plant life. Then aquascaping might just be what you are looking for. Most shapes and sizes of driftwood can be easily incorporated into an aquascape design. Features of the wood that you wish to be a focal point, can be made to stand out. The same thing can be said with regards to the less desirable features, as they can be easily hidden or buried among the plants and substrate. For more information on whats involved with aquascaping. See our article on How To Setup an Aquatic Plant Environment. Picking the correct type of driftwood goes hand in hand with picking the correct fish that are to go into the aquarium. Some driftwood would continue to release tannis, toxins or saps, even long after the wood had died off. So pairing the driftwood with fish that can thrive in the sort of water quality that they would produce, is advisable. As driftwood breaks down and begins to rot. They can turn the water tea-colored and can change the pH levels of the water. Fish like the Tetras (Paracheirodon Axelrodi) and the Dwarf Cichlids (Apistogramma Nijsseni) actually like to live in tea-colored, acidic water, as its similar to the waters in their natural habitat, and will not need that much additional maintenance. Most others species however will require more frequent water changes in order to keep the water quality palatable. For this reason only use softwoods if you are prepared to perform additional maintenance. Otherwise hardwoods would be the go to wood. Also make sure to use wood that is suitable for the environment and behavior of your fish. Fish with delicate fins like bettas, should be kept away from sharp and jagged edged driftwood. As this can damage their fins. Similarly avoid driftwood that could prevent your fish from having access to places to swim or hide in. Collecting driftwood from the wild has its own potential risks when using it in your aquarium. The same thing can be said when sourcing wood from a less reputable supplier. Or trying to use wood from a hardware store may also be risky. Some of these pieces of driftwood could have been exposed to toxic chemicals, poisons, or pests and parasites. Never use green/fresh wood. The wood needs to have fully died off and dried out. Only use driftwood that can be sourced from reputable suppliers. If you trust the source, but the wood requires additional treatment prior to installing it into your aquarium. 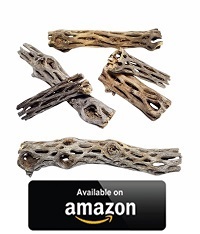 Or if you need help installing your new piece of driftwood. Please see our guide on Aquarium Wood, and follow the steps for preparing the driftwood for use. 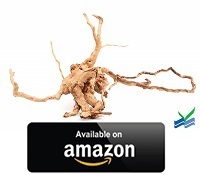 If you are unable to find a safe and reliable source for driftwood. You may want to consider using resin driftwood. Fake decorations have come a long way in recent years and there might be an option available for you to use. There are some drawbacks to using resin products however. The cheaper models do not look very convincing and may standout as being fake. Also regardless of price, the color can fade out of most of these products. Some products can keep their color longer then others. It is advised that you look at reviews prior to purchasing any fake decorations. Keep in mind, that since driftwood is in fact natural, the chance of finding two pieces that are very similar to each other, will be highly unlikely. This means that you might get lucky and find the perfect piece. Or more then likely, you may need to compromise and build your aquarium layout around the best piece driftwood that you can find. In the list below will provide a basic description of how the driftwood can be found. If you find an usual piece that breaks the mold, it may be worth considering, to change your design to incorporate this unique piece. Produced by using the same techniques as the Japanese art form of growing miniaturized trees. 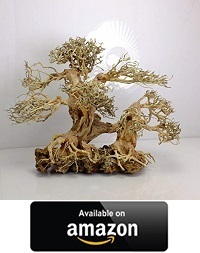 There are many varieties of “bonsai” driftwood that are available on the market. Some of these pieces are the remains of actual bonsai that have died off, and are being given for a second life as aquarium driftwood. 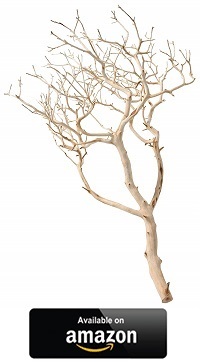 Other pieces are purposely produced by manipulating the branches of a full sized plant, or by combining various pieces of driftwood to replicate a bonsai. Confirm the type of plant/wood that the piece is made of prior to purchase. As these pieces can be made from a large range of plants. Kept Barren – If the bonsai has a lot of little branches at its tips. They may look resemble gnarled hands and fingers. This sort of concept works well for hardscaping and can give character to a desolate landscape. This also works well in a Gothic setting. Miniature Trees – Using the planted driftwood technique. Attach epiphytes plants such as Java Moss to the ends of the branches. This can simulate a tree top, with some bonsai driftwood having enough branches to form a full canopy. Fallen Tree – If the bonsai is damaged on one side of the plant. This can be hidden effectively by laying the plant damaged side down. Build the substrate up around the driftwood and either have plants growing up and over the truck like grass. Or have the tree look like it has found a way to survive and is growing at the branches that are reaching up. A common item that can be purchased from most pet stores. These hollow shells can be found with or without their fibers. 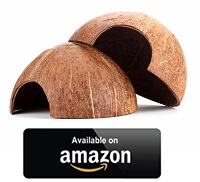 Most coconuts are sold in halves, some may even have a notch cut onto one surface. These means that they can be used as hiding spots and spawning caves for small fish. The advantage to using coconut husks, is that they have little to no effect on the water quality. They can also be easier to shape/sculpt to suit a desired theme. Hardscaping – Hide the coconuts among the rocks or build the substrate up around the husks. This will give the fish somewhere to hide while making it easy for you to find them if need be. Just make sure that the opening is big enough and easily accessible for your fish to get in and out of. Planted Husks – Attack the desired plants to the surface of the husk. This can give the illusion of grass covered mounds and hills. As well as the appearance of a cave. Hobbiton – Using the planted husks approach. The tank could be aquascaped to look like the home village of the Hobbits from the Lord of the Rings movies. By stacking and burying the coconut husk into a moss or surface plant covered “hill”. The husks could be made to look like a hobbit-hole (house). With a little ingenuity and creativity paths and stone walls could be built. Giving the illusion of a lived in village. Also known as Namibia and African Driftwood. This type of driftwood has a fantastic earthy color, that can be a light to dark brown. The driftwood can have an unusual branching growth that’s full of knots and nodules. This driftwood is rather dense and easily sinks in water, so it doesn’t need to be anchored or weighed down. If this wood is not prepared properly, prior to installing it in the aquarium. It can leach out large volumes of humic acid and tannis. Mopani can be used to lower the pH levels and soften the water. A southeastern Asian driftwood, that is often found in linear shapes, with a dark orange color. Another dense type of driftwood that sinks very easily. Malaysian driftwood makes for an excellent perch to attached plants to. It is also sturdy enough to support the weight of some heavier objects. As mentioned earlier some fish like the tetras, thrive under more acidic conditions. So pairing them up with a piece of Malaysian driftwood. Could make them more comfortable. A lattice like hollow tubular structure. Cholla can be one of the more expensive driftwood on the market. They make an ideal home for shrimp and fry. Moss can be easily grown inside and over this wood. Making them ideal for replicating fallen logs. Aside from being one of the more expense driftwood. They are also one of the most fragile and easily broken down type of driftwood. Depending on your aquarium’s setup, the Cholla could be broken down in a matter of months if not a couple of years. Cholla are best used in aquariums that will not be highly reliant on the Cholla remaining part of its layout, for an extended period of time. So called for its spider like appearance. Spider wood is from the root system of the Azalea. They have beautiful, elongated, interwoven branches. This wood is quite delicate and should only be used for aesthetic purposes and nothing structural. Only make sure to buy spider wood from a reputable dealers. As there is a cousin species, the Rohdodendron, which is highly toxic for fish. 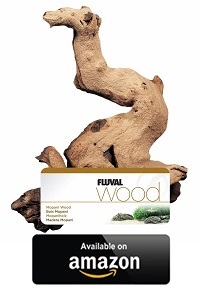 This wood can begin to disintegrate within 6-12 months of being installed into your aquarium. It is highly important that the wood is prepared correctly before installing it into the aquarium. As the wood will leach high level of tannis is left unchecked. Always remember to choose a piece of driftwood that will not cause your fish any harm be it physical or health related. Make sure that you are prepared to perform any additional water maintenance that may be required. Once this is sorted, sit back and admire the work that you put into your aquarium layout.